I’m really excited to be joining in with a new linky from the wonderful Julia who blogs at Rainbeaubelle. For a few months now she has been doing a Five Under £5 post, sharing little bits and bobs, and they have been some of my favourite posts to read. I’m so pleased she has asked people to join in as I am a serial moochy shopper. I very rarely go into a shop and buy only what I was supposed to, I can’t help but have a browse round and find something else to add my to basket. I had so many things to add to this post and even as I’m writing it I’m thinking of other things I could have included, I was really spoilt for choice! There is definitely a Christmassy theme to mine this month, not intended but easily done when the shops are full of it. 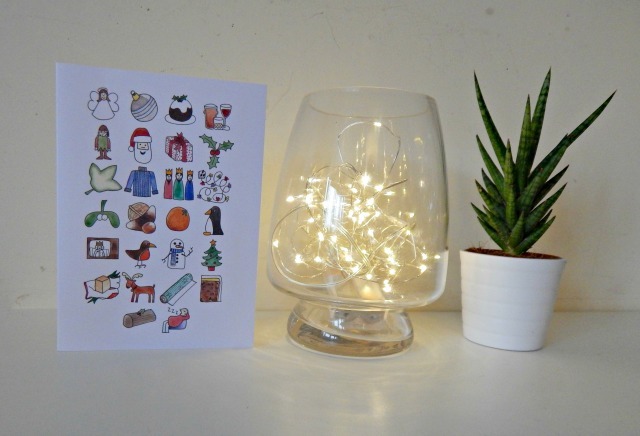 The fairy lights and glass candle jar are both from Matalan. I saw them on display in there, set up like this and hunted them down. The fairy lights were £5, they are battery operated with tiny lights set on a wire which makes them perfect for sitting in the hurricane jar which was £3. I bought them initially for Christmas but to be honest I think I’ll keep them out all year round, they look so pretty when it goes dark. The Christmas card I actually bought in a set last year from a Christmas market but I was thrilled to find I had one left which I’m going to frame to go on my picture ledges over Christmas. 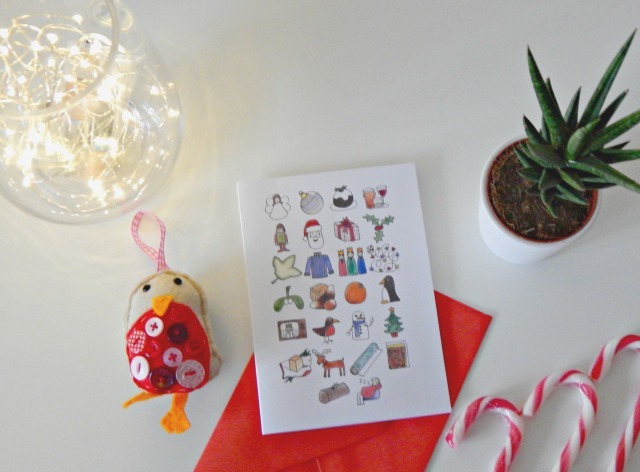 These are designed by a local illustrator, Becky Griffin and you can still get this card for £2.50 from her Etsy shop. The little green spiky plant was an impulse by from IKEA and a great little bargain at just £1. I was in there hunting out picture frames and started to look for a plant that would fit on the picture ledges when I spotted this. I really wanted a splash of green up there but it had to be a tiny pot, they had a few of these in different coloured pots and several types of plant. Think I’ll pick up a couple more next time I’m in. Lastly is the cute Robin tree decoration and I love him because he is homemade. 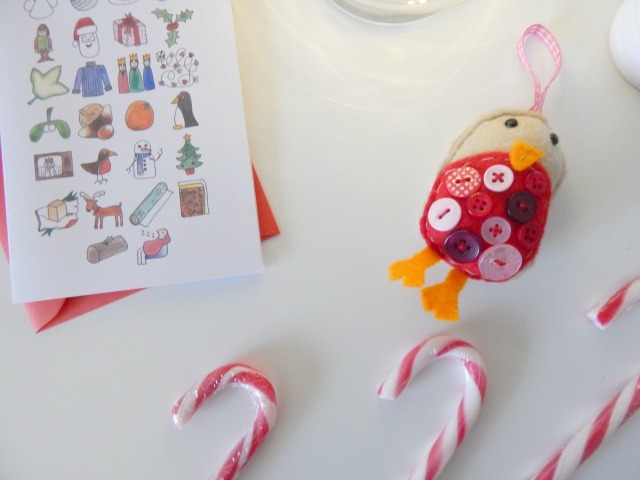 Each year I buy a new sew your own kit from Paper and String on Etsy, so far we’ve had a reindeer, a snowman, Christmas tree garland and this time the robin for £5. I think they are really fun and if I can sew them anyone can…I am notoriously bad with a needle and thread. The candy canes aren’t really included as my fairy lights and glass jar count as two but I picked up a pack for a pound from Lidl to hang on our Christmas tree and of course to use in photographs! If you fancy joining in too then do go and have a read of the post on Julia’s blog or search for the hashtag #fiveunder5. Isn’t Matalan amazing for home items?! I can bypass the clothes but they have so many lovely candles and dishes and ornaments. I quite often pop in and see what I can find. It is SO good, I was in there looking for tights, as you do and got drawn into their home section, great value too! I couldn’t wait to join in either! I love the lights in a vase idea and mean to recreate it every year I spot it. Maybe this year will be the one!! I love those fairy lights in the hurricane vase! I’d keep them all year round too. I too am a moocher – we should never EVER shop together as we may go missing for days! !